Conservative talk show radio host and best selling author Mark Levin endorsed Florida senate candidate Marco Rubio for US senate tonight. 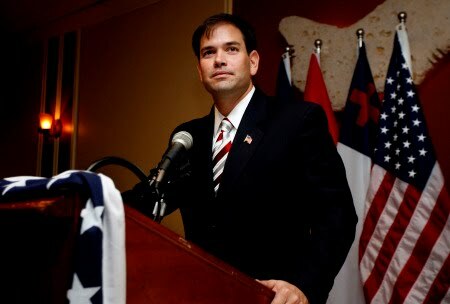 The endorsement was made during an interview with conservative senator Jim DeMint. Senator DeMint endorsed Rubio earlier this year. Levin said to SEND HIM MONEY and vote for him! I will post the audio of Levin's endorsement when it becomes avaialble. This comes at about the 50 minute mark of the audio. The audio is available here .It's the 10/01 show audio. Mark Levin: ...These are two solid conservatives (Rubio and Toomey) who are running against the system. Running against really their own republican establishment and running against the democrats. Mark, what can I do? Well in these states you can do something very direct and very specific. You can send these candidates money! You can make sure you are registered to vote.....It's that simple.... We need these men NOW!!! I simply cannot fathom the good people of FL voting for Charlie Christ. He is the Republican sitting governor with campaign funds in his Senate coffer raised by the Republican Party, which he will not return, while abdicating the obvious decision of the Republican Party to run a true conservative in the general election. On top of that he is walking around the state holding hands with Obama, favoring his radical agenda and being at the very best a double talking self serving narcissistic politician. What does it take for the people to throw you to the curb?